Photo shows the bow of the ship and catapult cables. 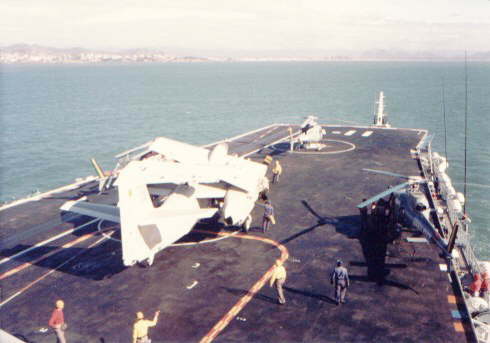 The black markings on the flight deck are tie-down points for aircraft or helicopters. 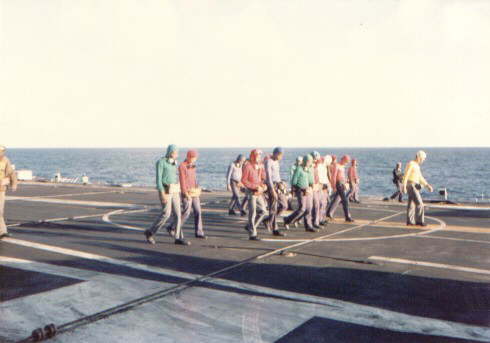 The Foreign Object Damage (FOD) patrol, search the flight deck for foreign objects or damage. 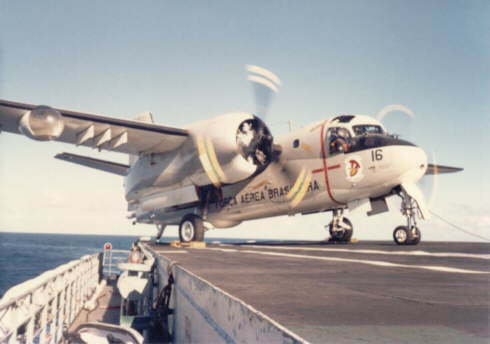 The white boxes at the both edges of the flight deck are for the emergency barrier stowage. Close to the arrestor wires is a three digit, white painted number that marks the ships length, from the bow, in feet. The "[" shaped marking are for the P-16´s main landing gear parking help. In this photo you have a closer view of the lifting bar for the arrestor wire and its hydraulic actuator. Note the wide wire junction near the left of the photo. The centre section of the cable could be replaced by dismantling those joints. An Brazilian Air Force (Força Aérea Brasileira) P-16A 7016 prepares for take-off. 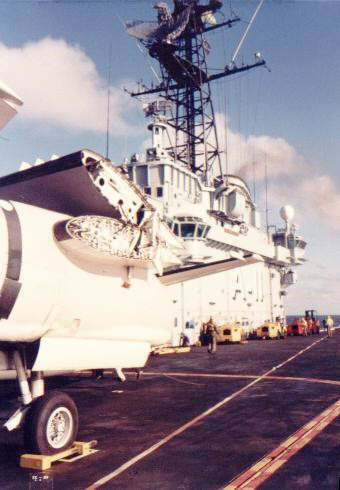 The stowed flag pole lying along the catwalk edge (this was assembled while in port) was fitted to the aft of the ship and the red dome light, marked the outline of the flight deck at night. This aircraft today is preserved in its original splendour at the Brazilian Air Force's Museum. 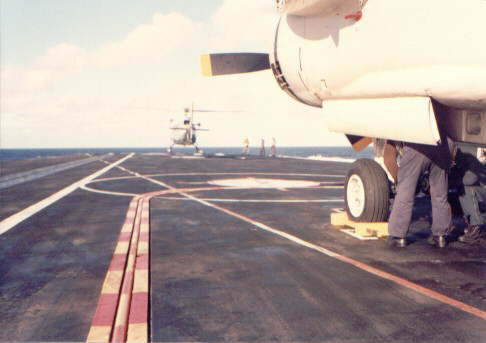 Note the kind of bunker, that is magnified by the camera proximity, from where the arresting wires communicates with the bumper system below decks. The wire itself running to the centre of the deck, is the one that leads electric power to the aircraft's starting systems. Looking forward from the front port lift side. The red and yellow markings, is a security barrier that rises, prior to the descent of the lift. Looking starboard side and aft from the front port lift side, clearly showing the island and pennant number of the ship. 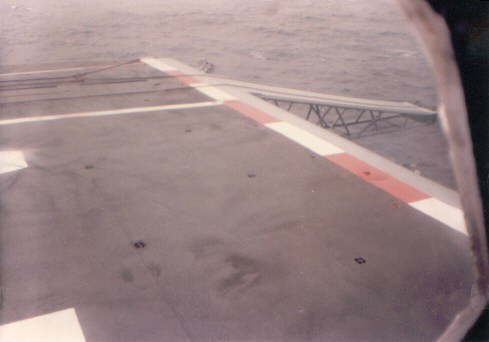 Shows the catwalk, starboard side, looking aft, just before the island, which is obscured by the parked P-16. 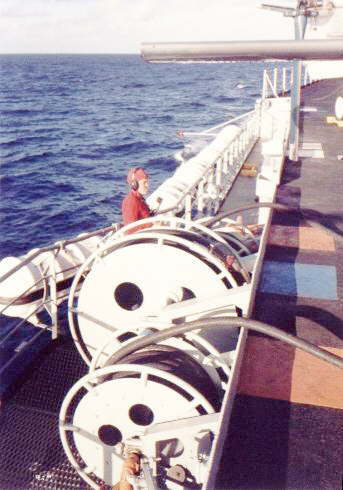 The fuel reel hoses are identified by the colour squares painted on the flight deck: Orange to Av Gas, Blue to jet fuel - Kerosene. 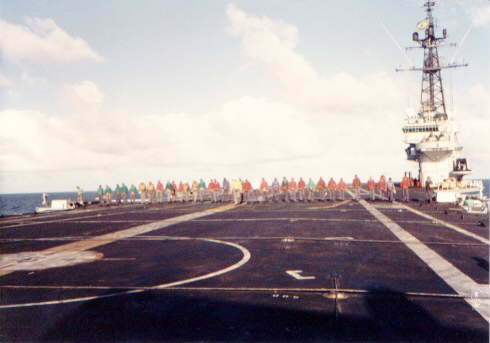 Another view of the catwalk, starboard side with two ratings dressed in red, bottom right corner of the photo. 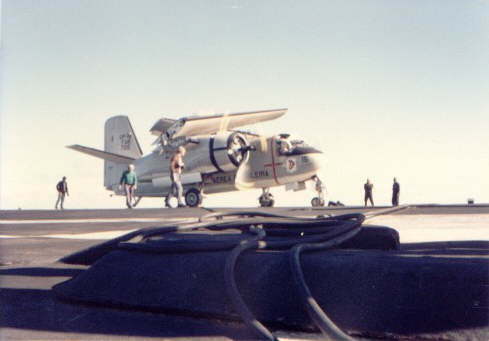 The fuel markings (Orange and Blue) can be seen on the flight deck. The white mast ahead of the ship is from a harbours tug, towing the ship into Vitória City. (Victory, not the ancient Queen). 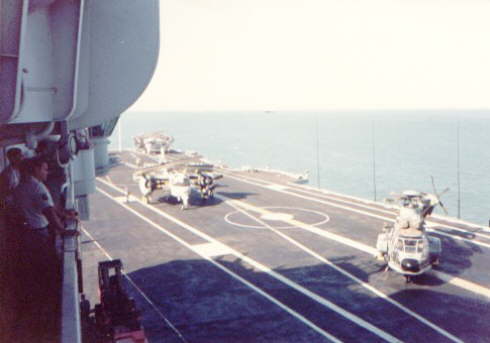 Another view of the flight deck, with the radio antennae raised at the decks edge. The aft flag pole is in position as the ship prepares to enter harbour.